1926. 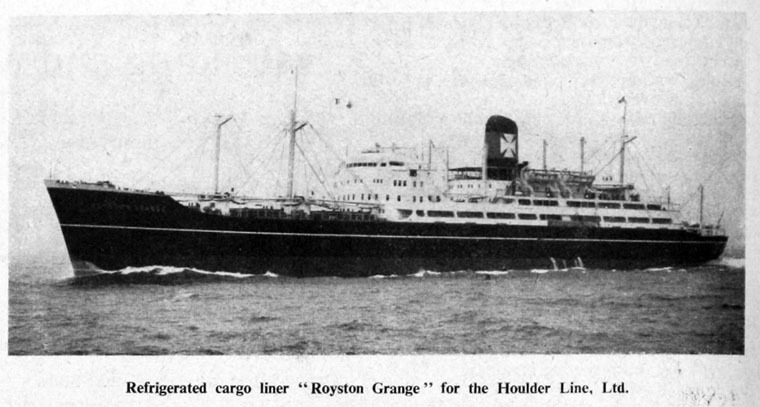 The Motor Refrigerator Ship "Upwey Grange". 1856 Houlder Brothers and Co was formed in London; operated with chartered tonnage until 1861 when they aquired the Golden Horn. First served the USA and later New Zealand, Australia and the Pacific Islands. 1906 the Federal-Houlder-Shire Line was formed with Federal Line and Turnbull Martin's Shire Line to operate services from Glasgow, Liverpool, Manchester and Avonmouth to Australia and New Zealand, later restricted to Australia alone. 1911 Furness, Withy and Co purchased a 50% share in Houlder Brothers and Co; the company withdrew from the Federal-Houlder-Shire partnership. 1915 the Furness-Houlder Argentine Line was formed. 1947 Complete control of Alexander Shipping Co was acquired. 1960 Founded Warwick Tanker Co.
1966 The British Empire Steam Navigation Co was renamed Welldeck Shipping Co.
1975 Empire Transport Co. was renamed Dee Navigation Co.
1980 C. Y. Tung of Hong Kong took over Furness, Withy and associated companies; the remaining Houlder Line ships were transferred to Furness, Withy (Shipping) Ltd. This page was last edited on 23 April 2015, at 11:59.